Proofing is dog trainer’s lingo for setting up an exercise where a dog has choices and the hope is if your training was good he or she will choose correctly. In the world of medical detection dogs the proofing is done fairly early in the process of the scent association conditioning. In the beginning of my Super Sniffer™ program I have the scent contained in an easy to hold metal tin. I am using this deliberately as a visual cue to the dog, but I am not rewarding the dog for looking at it, bumping it with his nose, pawing at it, or licking at it. I am only rewarding when the dog sniffs the tin. This concept is easy for the dog to figure out and one reason it is so successful with so many different types of dogs, including breeds you don’t commonly think of as working dogs. After enough repetitions of the sniff and reward, the whole exercise is becoming a conditioned response. The dog is learning when he sniffs the tin he will get a nice food reward and praise. What needs to happen however for us to be successful in detector work is something different. The dog needs to figure out it is the presence of the odor inside the tin that we are really rewarding for. In order to connect the dots here for the canine mind we set up a simple exercise, which we often refer to as proofing against visual cues. Take two sniffer tins (or whatever container you are using) that are identical and make sure one of them is clean and new and has never had any scent material in or near it. The other tin will contain your target odor. I scratch on the back of the tin with the target odor a large X so I will not mix up the tins and reward the dog for sniffing the wrong tin. Now hold both tins out for the dog to see. A lot of the dogs will go to the closest tin, which for our example we will say is a blank. They sniff it and then sit. False sitting like this is very common at first. This behavior tells you the dog is thinking, “I sniff the tin, I sit and I get fed.” If you do nothing he will in due time get up and go to the other tin and do exactly the same thing. This time you reward him. Now the dog is thinking, “Hmmm, I got food for sniffing that tin, wonder what was different about it?” After a few more times they soon figure out “OK I get it, it is the tin with the funny smelling stuff that I get rewarded for” and they will not waste any more time on the other tins there after. 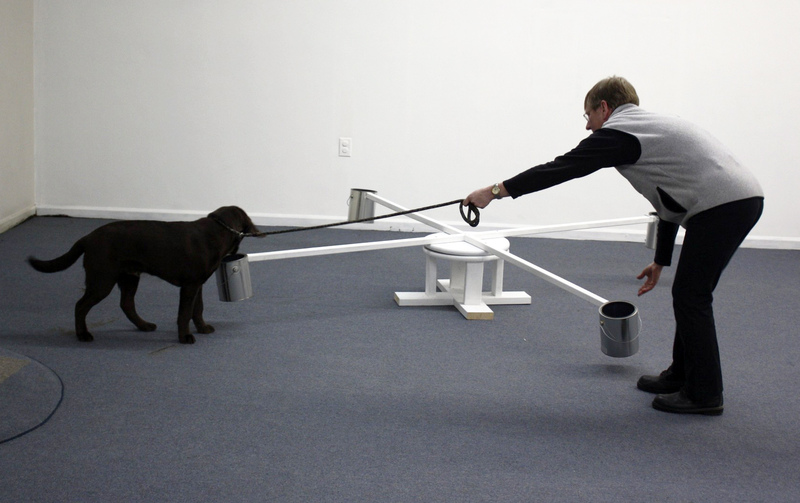 Another way of proofing the dog to test the understanding is to set up a test using 4 similar objects such as new paint cans. The cans should be set up in a circle. Circles are important with the testing so the dog has the option of going around again and again if need be and sniff each can again until he makes up his mind which one is the target odor. When you have many similar objects and the target odor is in one, you are forcing the dog to choose by smell which one is correct. The other cans may contain materials that are present where the dog is normally working. For a diabetes alert dog these samples would be saliva samples collected from non diabetics whose blood glucose readings are outside the range the dog is trained to alert on. In a set up like this the dog is being proofed that he will not alert to the cotton collection material or saliva, only to the presence of the diabetic odor. During certification testing there is one additional step to this type of proofing exercise, it is called a double blind test. The term comes from the fact that neither the tester or the person taking the test know which container has the diabetic sample in it. The only person who knows is the third party person setting up the samples. In this situation when the tester asks the dog team to come in and indicate which can contains the diabetic sample there is no way the tester or the handler of the dog can cue the dog, only the dog and his nose will be able to detect which sample is the diabetic sample. When the dog indicates the sample, the tester can look at the bottom of the tin to see if it has the X mark scratched on it, indicating the dog alerted to the correct sample. This is the only fair and acceptable way to test a dog’s understanding of the odor it is required to alert on. This method of double blind testing is commonly used in all fields of science. Unfortunately, for a diabetic alert dog, this is a bit abstract compared to his real job of alerting on people; but for testing purposes there is no way to control people’s glucose levels to make the test reproducible and uniform for all to take using people, instead of cans and scent samples. This Labrador is indicating to his handler which can contains the sample he was trained to alert on. The value to the handler and trainer of proofing comes in the form of knowing without question the dog completely understands the scent he is suppose to alert on. To hear a discussion about double blind testing at a recent medical alert dog workshop visit my You Tube page at this link.